Dr. Linda Eddy, associate dean of Western Washington and associate professor, was promoted to professor effective fall 2018. Dr. Roschelle Fritz, assistant professor, received the Western Institute of Nursing Geriatric Nursing Research Award for a New Researcher in April 2018. Dr. Fritz also is part of an interprofessional team of scientists from Washington State University that landed a $1.77 million grant to research how “smart home” technology can monitor the health and safety of senior citizens from afar. In addition, Dr. Fritz is an Invited Speaker and Trainer at NINR’ weeklong boot camp on Precision Health: Smart Technologies, Smart Health which is being held in Bethesda, Maryland, in July 2018. Dr. Celestina Barbosa-Leiker, associate dean for research and associate professor, and her research team had two studies funded to examine the transition from pregnancy to parenthood in women who are in treatment for an opioid use disorder, and for women who use cannabis during pregnancy. Drs. Barbosa-Leiker and Michele Shaw also continued to work with school districts on testing an alternative to out-of-school suspension for students who violated the schools’ cannabis policies. Dr. Barbosa-Leiker had 23 publications in 2017-2018 primarily focused on substance use. She also contributed to NIDA responses to questions posed by the President’s Commission on Combating Drug Addiction and the Opioid Crisis related to women with opioid use disorders. Addy Hatch, director of outreach & communications, received the WSU College of Nursing Staff Excellence Award in May 2018. The award recognizes excellence in a pattern of outstanding service. The individual displays professionalism, leadership, teamwork, and commitment to enhancing the milieu of the College. Dr. Renee Hoeksel, professor, received the Washington State University V. Lane Rawlins President’s Award for Distinguished Lifetime Service in March 2018. Dr. Hoeksel was also inducted as a Fellow of the NLN Academy of Nursing Education on September 16, 2018 at a ceremony in San Diego, California. In addition, Dr. Hoeksel received the WSU College of Nursing Faculty Mentor Award in May 2018. The award honors a faculty mentor whose dedication to faculty colleagues has made a significant contribution to the quality of life and professional development of nursing faculty at the WSU College of Nursing. annual meeting in Washington D.C. Fellows are selected for their significant contributions to nursing and health care, and the impact of their career on health policies and population health and well-being. Dr. Katz was the only inductee this year from Eastern Washington, and one of just three from the state. In addition, Dr. Katz received the WSU College of Nursing Graduate Faculty Excellence Award in May 2018. The award recognizes a graduate faculty member who demonstrates excellence in teaching, research, and service. Lee Anne Kifer, instructor, was promoted to senior instructor effective fall 2018. Dr. Connie Nguyen-Truong, assistant professor, was awarded the Western Institute of Nursing Gerontological Special Interest Group Best Gerontology Research Presentation for “Conceptual Framework for Smart Home Research and Practice with Minority Older Adults” (Dr. Connie Nguyen-Truong, Tuong Vy Le, MS, Dr. Roschelle L. Fritz, 2018) at the 2018 Western Institute of Nursing Conference. Dr. Nguyen-Truong received the WSU College of Nursing Excellence in Diversity Award in May 2018. She received the 2017 Immigrant & Refugee Community Organization Success Story Honor. She published four papers in 2017 on health care delivery; beliefs about cervical cancer, screening, and cancer prevention vaccines among Vietnamese American women; culturally targeted mammography intervention for Vietnamese immigrant women; and methods on engagement of community partners in research. Lori Parisot, instructor, was promoted to senior instructor effective fall 2018. Sue Perkins, senior instructor, received the WSU College of Nursing Undergraduate Faculty Excellence Award in May 2018. The award recognizes an undergraduate faculty member who demonstrates excellence in teaching, research, and service. Dr. Julie Postma, associate professor, was honored with the Public Health Leadership Award by the Washington State Public Health Association at the organization’s annual meeting in October 2017. The award conferred by the statewide organization recognizes a person who’s demonstrated sustained leadership in public health advocacy, research, education, or equity and social justice. In addition, Drs. Julie Postma, Gail Oneal, Celestina Barbosa- Leiker and Patricia Butterfield received a grant from the Association of Community Health Nurse Educators to adapt the “Revised Self-Efficacy in Environmental Risk Reduction (r-SEERR) Instrument” to Spanish-speaking populations. This grant will be awarded at their annual meeting in June 2018 and run for a period of one year. Kyle Ross, academic coordinator/advisor, was elected to serve on the NACADA Council as an Advising Communities Division Representative for the 2017-2019 term. Kyle gave presentations at both the NACADA International and Annual Conferences of 2017 and the Region 8 Conference of 2018. Lisa Stecher, clinical contracts coordinator, received the WSU College of Nursing Staff Achievement Award in May 2018. The award recognizes excellence in an outstanding single achievement. The individual displays professionalism, innovation, and commitment to enhancing the milieu of the College. Dr. Linda Ward, assistant professor, was promoted to associate professor effective fall 2018. Dr. Marian Wilson, assistant professor, received the WSU College of Nursing Excellence in Research Award in May 2018. 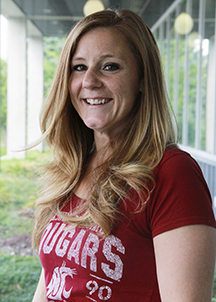 Laura Wintersteen-Arleth, senior instructor, received the Washington State University Crimson Spirit Award in September 2017. The award is a special commendation for WSU faculty and staff who have provided outstanding service and have exceeded expectations while representing the university.